"Many of my countrymen and women have given their lives or been seriously wounded in the pursuit of protecting Afghans, and we honor the enormous sacrifices they have made, side by side with Afghans." FILE - In this Sept. 20, 2011 file photo, President Barack Obama meets with Afghan President Hamid Karzai in New York. 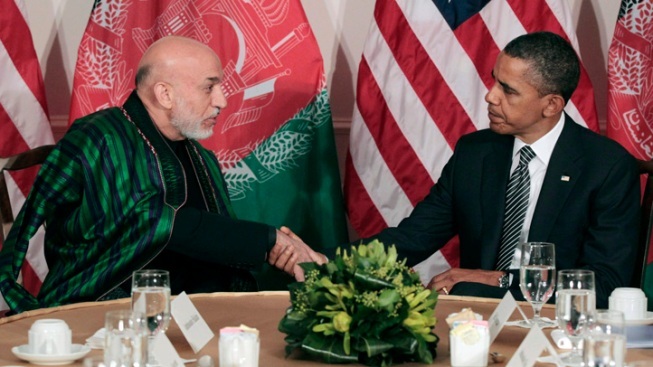 President Barack Obama wrote to Afghanistan President Hamid Karzai about a draft agreement on a bilateral security pact. The letter, obtained by NBC News, comes as a grand assembly of Afghan tribal elders meets to consider the deal outlining the future of U.S. forces in Afghanistan. I am pleased that we have reached agreement on the text of a Bilateral Security Agreement that will enable the United States and Afghanistan to implement the promise of our Strategic Partnership. This is a strong agreement for both our countries, which provides the foundation to continue our cooperation to build a better future for Afghanistan. It provides the basis for cooperating in a new context after 2014, when the International Security Assistance Force mission will have ended, the number of U.S. forces will be much reduced, and a sovereign Afghanistan will be responsible for its security, with the support of the international community. In that new context, America's role in Afghanistan will be one of a supporting partner. Under this Agreement, we will be cooperating in training, advising, and assisting your forces and in a targeted, smaller counterterrorism mission as we continue to help strengthen Afghanistan's own growing counterterrorism capabilities. We look forward to concluding this agreement promptly. I know that you have been concerned for some time to limit the impact of the conflict in Afghanistan on the Afghan people, with particular attention to the sensitive issue of the safety and privacy of people in their homes. Over time, and especially in the recent past, we have redoubled our efforts to ensure that Afghan homes are respected by our forces and that our operations are conducted consistent with your law. We will continue to make every effort to respect the sanctity and dignity of Afghans in their homes and in their daily lives, just as we do for our own citizens. Many of my countrymen and women have given their lives or been seriously wounded in the pursuit of protecting Afghans, and we honor the enormous sacrifices they have made, side by side with Afghans. As this new Agreement states, U.S. forces shall not enter Afghan homes for the purposes of military operations, except under extraordinary circumstances involving urgent risk to life and limb of U.S. nationals. The U.S. commitment to Afghanistan's independence, territorial integrity, and national unity, as enshrined in our Strategic Partnership Agreement, is enduring, as is our respect for Afghan sovereignty.